This is like normal curry only with a variation that here we use a coarse powder from fried 4 small red chillies, 1 tbs coriander seeds, 1 ½ tbs Bengal gram dAl and ¼ tsp asafoetida. The other procedure is the same as for normal curry when you add this powder after the cooked vegetables are added to the seasoning omitting the chilli and coriander seed powder. In the case of non-cooked soft vegetables, only after the vegetables are sautéed and cooked well with turmeric powder and salt, this powder is to be added. In case you also add onion while sautéing, then asafoetida may be omitted from the ingredients for the coarse powder. Brinjal, potato, capsicum, bitter gourd, banana, yam and ladies finger are suitable for this type. 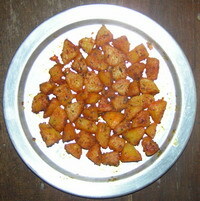 If you use bitter gourd or ShuNDaikkAi, then you need to boil the pieces in diluted tamarind extract with turmeric powder and salt and after it is cooked, you can strain water and then use for preparing curry. If you are very particular about its nutritious value, then take a little tamarind extract only and cook the pieces covering with a lid. After they are cooked, straight away you can prepare the curry as the extract must have reduced. Here the pieces may be a little bitter of course. 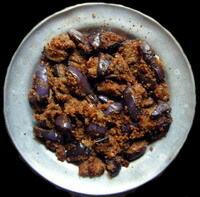 In case the brinjal is a bit bitter, you can add about 2 tbs diluted tamarind extract when you sauté. 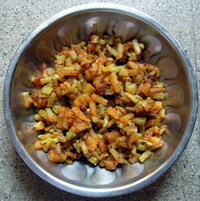 In case you make this type of curry from ShuNDaikkAi or bitter gourd, you need to add 1 tsp roasted sesame powder also. For this we use potato and colocasia only. Here we boil or pressure cook the vegetables without cutting after washing and when cooked well, we peel the skin and cut them into bigger size. We take 1 tbs corn flour or rice flour with salt to taste, ¼ tsp turmeric powder, a pinch of asfoetida and red chilli powder as per taste. Mix well and then smear this mixture well over the cut pieces of cooked potato or colocasia. Take a big ladleful of refined oil in a kaDAi and heat it under simmered flame. When the oil is hot, add a tsp of mustard. After it splutters, add the coated vegetables to the oil and fry well. 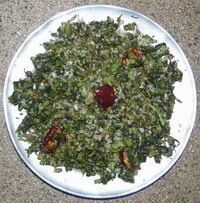 For this type, we need common greens or MuLaikkIrai, with conical shaped leaves. Wash and clean. Remove the roots. Chop finely. Cook it well for 10 minutes in a vessel adding ¼ cup of water, ¼ tsp turmeric powder and salt to taste, covering with a lid simmering the flame. Twice or thrice in between remove the lid and turn it and close the lid. After it is cooked well, remove from the fire. If you want to add green gram dAl or split gram dAl which is optional in place of coconut or may be used along with it, you need to cook the green gram dAl directly and pressure cook the split gram dAl. Take refined oil in a kaDAi, heat and add 1 tsp black gram dAl, 1 tsp mustard seeds and 2 or 3 crushed red chillies for seasoning. After these splutter, add the cooked kIrai and ½ tsp sugar and the cooked dAl with fresh grated/shredded coconut or only coconut or dAl. Turn for 5 minutes and remove from fire. 1. When you buy banana flower, ensure that they are creamy yellowish instead of red so that they will not have much astringent taste. Similarly, bitter gourds should be of pale greenish instead of dark green in colour so that they will not be very bitter. The very small ones, called “midhi pAgaRkAi”, “chiRu pAgaRkAi” or “rudrAksha pAgaRkAi” are not bitter or will be less bitter. 2. After steaming the chanA dAl & thUr dAl mixture for paruppu usili, the normal practice is to break the lump by hand for mixing with the vegetable or onion in which way there may not be homogeneity. The ideal procedure is to grind the steamed dAls after cooling them for just a second only as mentioned above to have a coarse uniform mixture. This entry was posted on March 27, 2011 at 10:21 pm and is filed under Curry Varieties with tags asafoetida, ash gourd, banana, banana flower, banana stem, beans, beet root, bitter gourd, black gram dAl, bottle gourd, brinjal, cabbage, carrot, cauliflower, chou chou, clustered beans, coconut shreds, colocasia, coriander leaves, coriander seed powder, curry, curry leaves, egg plant, French beans, fresh grated coconut, fried curry, green chilli, idichchu vitta curry, kadai, ladies finger, mustard, potato, pumpkin, radish, rasam, red chilli, red chilli powder, refined oil, salt, saute, snake gourd, sugar, turmeric powder, vegetables, yam. You can follow any responses to this entry through the RSS 2.0 feed. Both comments and pings are currently closed.